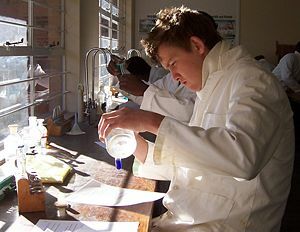 Some chemistry experiments can be conveniently carried out at room temperature. Room temperature (also referred to as ambient temperature) is a common term to denote a certain temperature within enclosed space to which human beings are accustomed. Room temperature is thus often indicated by general human comfort, with the common range of 18°C (64°F) to 23°C (73°F), though differences in climate may acclimate people to higher or lower temperatures—for instance, 78°F could be a common temperature for some people. The term may also refer to the temperature of food to be consumed (such as red wine), which is placed in a particular room for a given time. In addition, it may refer to a certain temperature within settings of scientific experiments and calculations. For human comfort, desirable room temperature greatly depends on individual needs and various other factors. According to the West Midlands Public Health Observatory (UK), 21 °C (70 °F) is the recommended living room temperature, whereas 18 °C (64 °F) for bedroom temperature. A study carried out at the University of Uppsala (Sweden), on indoor air quality and subjective indoor air quality (SIAQ) in primary schools, states that perception of high room temperature was related to a poor climate of cooperation. To achieve a good SIAQ, it recommends room temperature should be at a maximum of 22.0 °C (71.6 °F). For scientific calculations, room temperature is taken to be roughly 20 to 23.5 degrees Celsius, 528 to 537 degrees Rankine (°R), or 293 to 296 kelvins (K), with an average of 21 °C, about 72.8 degrees Fahrenheit (°F). For numerical convenience, either 20 °C or 300 K is often used. However, room temperature is not a precisely defined scientific term as opposed to Standard Temperature and Pressure, which has several, slightly different, definitions. The progress and results of many scientific and industrial processes depends a little or not at all on the temperature of the surroundings of the equipment. For example, a measurement of the charge of the electron does not depend upon the temperature of the test equipment. In such cases if any mention of temperature is made, it is customary and sufficient to speak simply of "room temperature," which essentially implies simply that what is being spoken of has not been specifically heated or cooled. Usually this means a temperature at which many people are comfortable, around 20 °C. In most cases, considerable temperature variations are irrelevant; work may be carried out in winter or summer without heating or air-conditioning, without mention of the temperature. However, productivity is dependent on thermal comfort. The phenomena that researchers may choose to study at room temperature can naturally occur in the range of 20 to 23.5 °C, or they may not. Researchers choose to study a process outside its natural temperature range for a variety of reasons, depending on what they wish to test experimentally. Experimentalists have an advantage in anticipating aspects of a room-temperature experiment, because the temperature is close to 20 °C (68°F, 527.4 °R, 293 K), at which many of the material properties and physical constants in standards tables have been measured. By consulting such tables, a researcher may estimate, for example, how fast a chemical reaction is likely to proceed at room temperature. Unless there is a reason to work at a specific temperature, it is clearly more convenient not to control the temperature. Even in cases where a known, controlled, temperature is advantageous but not essential, work may be carried out at room temperature. But, for example, very large, warehouse-type experimental facilities may lack sufficient heating and cooling capabilities to maintain 'room temperatures'. If it is believed that work which may have some dependence upon temperature has been carried out at temperatures significantly outside the range 20 to 23.5 °C, it may be reported that it was carried out at an ambient temperature of some approximate specified value. An assumed typical ambient temperature may be used for general calculations; for example, the thermal efficiency of a typical internal combustion engine may be given as approximately 25 percent, with no mention of the air temperature: the actual efficiency will depend to some extent on ambient temperature, decreasing in extremely hot weather conditions due to lower air density. Being an even less precise specification than "room temperature," "ambient temperature" may be a more correct description of the temperature. Because scientists strive for accuracy in their reports, many use this specification exclusively just as a matter of course, even to describe experiments that they could justifiably characterize as having been conducted at room temperature. This is a nebulous issue, depending upon the language used. In many languages, for example Spanish, there is no expression for "room," as distinct from "ambient," temperature. Arguably, no precision is lost in this practice: in disciplines where experimenters always work in laboratories, and where temperature differences of a few degrees make little difference with regard to the questions that scientists ask, the distinction between ambient and room temperature literally is not worth making. And, of course, the ambient temperature of a room is usually room temperature. ↑ Roberts, Michelle. Why more people die in the winter. British Broadcasting Corporation. Retrieved January 27, 2008. ↑ Norbäck, Dan. Subjective Indoor Air Quality in Schools - The Influence of High Room Temperature, Carpeting, Fleecy Wall Materials and Volatile Organic Compounds (VOC). Blackwell Synergy. Retrieved January 27, 2008. This page was last modified on 2 April 2008, at 15:33.